Page revised in August 2018. In November 284 the young co-emperor Numerian fell ill in Syria and died in rather obscure circumstances: Diocles, the head of the imperial bodyguard, accused the prefect of the Praetorian guard of having poisoned the emperor and killed him. Diocles was acclaimed emperor by the army and he took the more Latin name of Diocletianus (Diocletian). Carinus, the other co-emperor and brother of Numerian, was defeated in the following year by Diocletian, who thus became the sole ruler. The new emperor was aware of the weakness of his position: in the previous fifty years many emperors had been overturned after just a few years or even months of reign. Diocletian appointed as co-emperor (Augustus) Maximian, a general with a large support in the army, thus enlarging the base of his power. Diocletian chose as his residence Nicomedia (today's Izmit), a town near the Bosphorus, from which he could closely follow and react to developments on the Danube and Persian borders and in Egypt, a country which was shattered by religion driven revolts. Maximian took responsibility for the western part of the empire and he usually resided in Milan, in northern Italy. Rome was no longer the residence of the emperors and its Senate had less and less say in state affairs. Diocletian ruled for twenty years and he introduced radical reforms which had a lasting impact so that historians set at his time the beginning of the Late Empire, the last phase of the Roman Empire and even of the Middle Ages. Slaves were the main energy source of the Ancient World: the economy of Athens, the birthplace of democracy, was supported by the work of 20,000 slaves in the silver mines of nearby Lavrio. The procession of slaves behind the chariot of a pharaoh or a consul meant good news for the economy and the expansionistic policies pursued by all the ancient empires were very much dictated by the need to acquire unpaid labour. Diocletian realized that the Roman Empire had no longer the strength to conquer other nations; most of the slaves (or their descendants) had become freemen, although very often they had continued to work for their previous owners: because of repeated economic crises which had hit the empire in the IIIrd century many small farmers had been forced to sell their land: the agriculture had become based on latifundia, very large estates owned by a few families, which employed former slaves and former small farmers. Diocletian, by a mixture of fiscal and civil laws, laid the groundwork for the development of serfage, the feudal system where agricultural labourers were tied to working on their lord's estate. The empire security had been based for centuries on the defence of its borders; Diocletian changed this strategy by reducing the troops along the border and by stationing some legions at a certain distance from it with the aim of creating a sort of task force which would intervene when circumstances required it. This new approach required a larger army and this increased the tax burden, so that Diocletian had to complete his reforms by developing a new monetary and fiscal system. He tried to stop inflation by fixing maximum prices for many commodities throughout the whole empire. All these changes led to some reactions, but overall the stability of the empire brought about a period of economic development. Diocletian is remembered in Rome by the large baths built during his reign: as a matter of fact they were built by Maximian and dedicated to Diocletian, who visited Rome only once. They were larger than Caracalla's ones and so soundly built that most of their halls still stand. Through the centuries these halls have housed churches and granaries and more recently cinemas and restaurants. Diocletian tackled the issue of ensuring an orderly transition of power at the emperor's death by convincing Maximian that they should appoint their successors choosing them outside their family circle and that they should allow them to train for their future responsibilities by exercising power on a part of the empire. In Diocletian's mind the empire was to be ruled by an imperial family composed by two Augusti and by two Caesares. Every ten years the two Augusti would abdicate and be replaced by the two Caesares who in turn would nominate two other Caesares. This system was called Tetrarchy (four rulers) and it was first implemented in 293 when Diocletian chose as his Caesar Galerius Maximianus, (who married Valeria, Diocletian's daughter) and Maximian chose as his Caesar Gaius Flavius Valerius Constantius (known as Chlorus, the Pale, due to the whiteness of his face) who had married Maximian's step-daughter, after having renounced his first wife Helena. This reform of the government structure which split the empire into four areas was accompanied by an overall redesign of the empire territory which was divided into twelve dioceses, which in turn were divided into smaller partitions (provinces). This pyramidal structure anticipated that known as the feudal system. Diocletian introduced an elaborated ceremonial which was to be strictly followed by those who were admitted to his presence; they had to kneel down and kiss the lower part of his dress: they were not allowed to raise their eyes on the emperor who claimed to be a reincarnation of Jupiter. Diocletian was eventually forced to persecute those who refused to consider the emperor as a divine monarch. In 296 he issued a decree against the Manichaeans, the believers in a faith of Persian origin, resulting in numerous martyrs in Egypt and North Africa. Manichaeism was based on radical dualism between Good and Evil and it did not assign any role to the emperor. In 303 a similar decree was issued against the Christians and again the persecution was particularly cruel in Egypt, to the point that the Coptic (Egyptian) calendar counts the years from Diocletian's accession to the throne. In 303 Maximian, who had jurisdiction over Rome, erected in the Forum five columns to celebrate the tenth anniversary of the Tetrarchy: four columns were dedicated to the tetrarchs and the fifth to Jupiter. The reliefs of the only remaining base of the columns show a poor quality, a clear sign that the prolonged lack of commissions due to the absence of the emperor had had a negative impact on the availability of talented sculptors in Rome. In 305 Diocletian convinced Maximian that it was time for them to abdicate: Galerius and Constantius Chlorus became the new Augusti and they chose as Caesares two other generals: Severus and Maximinus. Diocletian had in mind the adoption process which had granted the prosperity of the empire from Nerva to Marcus Aurelius and he forced the other tetrarchs not to nominate their own sons as successors. The system he had devised worked as planned and the new Tetrarchy was accepted by the army. There were however two men who felt the system was depriving them of their rights: Maxentius, son of Maximian, and Constantine, son of Constantius Chlorus. In 306 Constantius died at Eboracum (York) and the troops that same day proclaimed Constantine Augustus; Galerius, the other Augustus tried to reach an accommodation and forced Severus to appoint Constantine as his Caesar. Galerius thought in this way to save the Tetrarchy, but just a few weeks later in Rome Maxentius, supported by the Praetorian guard, claimed for him the title of Augustus. Severus tried to restore his authority in Rome, but his troops deserted and he surrendered himself to the rebels. At this point Maximian made an attempt to return on the scene with the support of Constantine, who was his son-in-law, and against his own son. In 308 Diocletian, abandoning his retreat at Spalatum (today's Croatian town of Split), convened a sort of conference at the end of which Constantine was confirmed Caesar and a new man, Licinius, replaced Severus in the role of Augustus. Maxentius was never recognized either as Caesar or as Augustus and the tetrarchs regarded him as an usurper; however they did not move to crush his rebellion and for some years Maxentius ruled over Rome and parts of Italy and Africa. Maxentius tried to acquire legitimacy by emphasizing the ancient role of Rome: he built a new temple (dedicated to his deceased son Romulus) and a large basilica in the Forum and even a new hippodrome near Via Appia. The decoration of these buildings was to some extent taken from other monuments: an obelisk was moved from the city to the hippodrome (and later transferred from here to Piazza Navona by Bernini). The fine portal of the temple to Romulus is most likely a work of the previous centuries. In April 311 Galerius put an end to the persecution of the Christians and declared religio lecita (legitimate religion) their faith. A few days later he died: relations among the remaining three tetrarchs were very tense: Constantine controlled the western part of the empire with the exception of most of Italy, while Licinius and Maximinus ruled over its eastern part. Constantine thought the time had come to move against his brother-in-law Maxentius. He laid siege to Verona, which was loyal to Maxentius and, after having conquered this fortified town, he descended the Italian peninsula towards Rome. Maxentius had strengthened the walls of Rome, but nevertheless he decided not to wait for Constantine to lay siege to the city and the two armies engaged on the Via Flaminia, north of Rome. After the first unfavourable skirmishes Maxentius tried to retreat to Rome, but he had to manoeuvre in a narrow space because Via Flaminia is flanked by the Tiber on one side and by hills on the other. The retreat became a rout at Ponte Milvio and Maxentius fell into the river and drowned. 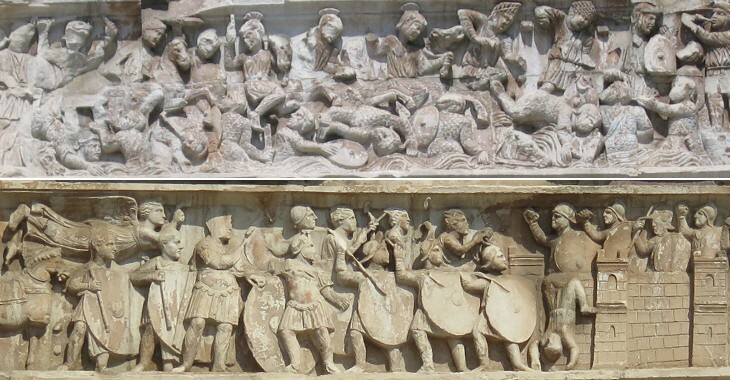 In 315 an arch was erected by the Roman Senate to celebrate Constantine: its decoration was mainly composed of reliefs taken from monuments to Trajan, Hadrian and Marcus Aurelius, but six reliefs portrayed the victorious campaign of Constantine against Maxentius. The inscription of the arch makes reference to a divine inspiration (ISTINCTU DIVINITATIS) which helped Constantine. According to the Christian tradition, before the battle Constantine had the vision of a cross accompanied by a cloth with the words EN TOUTOI NIKA (Greek) - IN HOC SIGNO VINCES (Latin) (with this symbol you will win) and he placed a cross and Christ's monogram on his war emblems. The relief portraying the battle of Ponte Milvio is damaged: a flying character can maybe seen in its left side: this character (an angel or more likely a personification of Victory) is very clearly visible in the relief showing the siege of Verona. It is interesting to note that the troops of Maxentius were represented wearing the uniform which (in Trajan's Column) identified the Sarmatians, a tribe living in southern Russia: the Senate chose to ignore that the battle of Ponte Milvio had been fought during a civil war, and not in a campaign against the empire external enemies. More than a thousand years later Maxentius and his soldiers were portrayed in Turkish clothes by Renaissance painters. In the lower relief Constantine appears to the right of the angel: his size is almost twice that of the other characters. The image used as a background for this page shows a detail of Constantine's Vision by Gian Lorenzo Bernini. Italians have a saying (parenti/serpenti - relatives/snakes) to mean that often the worst conflicts develop within a family; in 313 a row broke out in the imperial family designed by Diocletian: Licinius defeated Maximinus and became the sole ruler of the eastern part of the empire. He and Constantine met that same year in Milan where they jointly issued the Edict of Tolerance, by which they granted all citizens freedom in the exercise of religion. 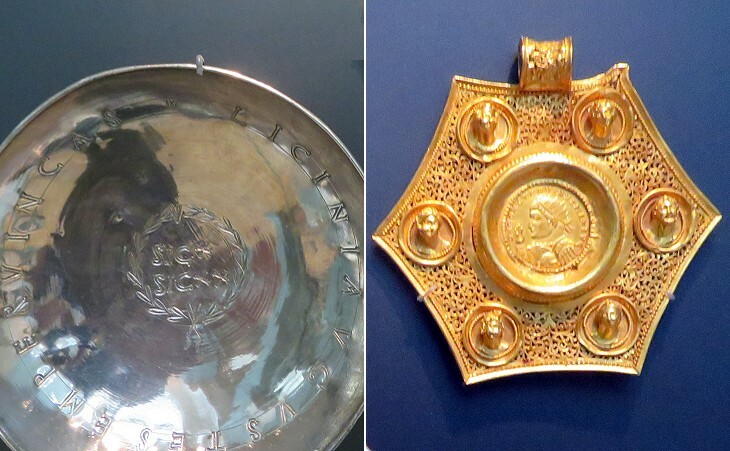 Constantine ruled over the western part of the empire where the ancient religion and the more modern faiths in Mithra and Sol Invictus were still prevailing; by this edict he thought to gain the favour of Licinius' subjects, many of whom had embraced the Christian faith. The two Augusti did not trust each other and in the following years they had repeated clashes. However it was only in 324 that their confrontation evolved into open war. Constantine defeated Licinius at Adrianopolis (today's Edirne in European Turkey) forcing him to retreat to Byzantium. Crispus, Constantine's oldest son and Caesar, blocked the city by sea, while a storm destroyed Licinius' fleet. Eventually Licinius surrendered and abdicated: he was initially treated as a sort of pensioner, but one year later he was executed. Constantine became the sole ruler of the empire. Constantine spent most of his life away from Rome: the government of the city was entrusted to a Praefectus Urbi who was also responsible for the maintenance of the imperial palaces. Many inscriptions and honorary columns dedicated to Constantine and other members of his family are "signed" by this high officer. It is interesting to highlight the use of new terms to define the emperor. While the first emperors were divinized only after their death, Diocletian required to be called dominus and deus (Lord and God) and the word dominus in particular was frequently associated with the following emperors. Maxentius used it in an altar dedicated to Mars, while the Praefectus Urbi used it with reference to the emperor. In addition to the arch the victory of Constantine was celebrated by building new baths on the Quirinale hill on the site of today's Palazzo Rospigliosi; they were decorated with statues and reliefs taken from other monuments, with the exception of statues portraying Constantine and his son by the same name. The sculptor portrayed them in the typical attire and posture of many other previous emperors, but the face is void of expression: the naturalistic approach of classical art was gradually being replaced by a symbolic one. In 330 Constantine renamed with his name the city of Byzantium where he had defeated Licinius. The monuments he built in Costantinopolis reflect the ambiguity of the emperor's religious politics. He built temples to Castor and Pollux and to Tyche, the local deity, and he placed at the top of a column a portrait of himself wearing the symbols of Sol Invictus, the god of the Sun, who was very popular among his troops. At the same time he allowed the Christian community to build large churches, in one of which (Aghia Apostoli - Holy Apostles - lost) he was eventually buried. He built an imperial palace which was not just a residence, but housed the large court which presided over the administration of the empire. Constantine played a significant role in trying to iron out the growing differences among the Christians. The main contrast revolved around the figure of Jesus who, according to the Egyptian theologian Arius, was subordinate to God the Father. This view was challenged by other bishops and eventually an ecumenical council (meeting of all bishops) was convened at Nicea. The outcome of the council was a condemnation of Arianism which was regarded as heretical. The Arian Creed however continued to be preached and had a large number of followers including members of the imperial family and Ulfilas, a missionary who converted the Goths, a group of Germanic tribes living beyond the Danube. The Edict of Tolerance allowed the Christians living in Rome to build their first large churches: the traditional layout of the pagan temple was abandoned both because it did not suit the Christian ceremonies and to mark a difference from the old beliefs. 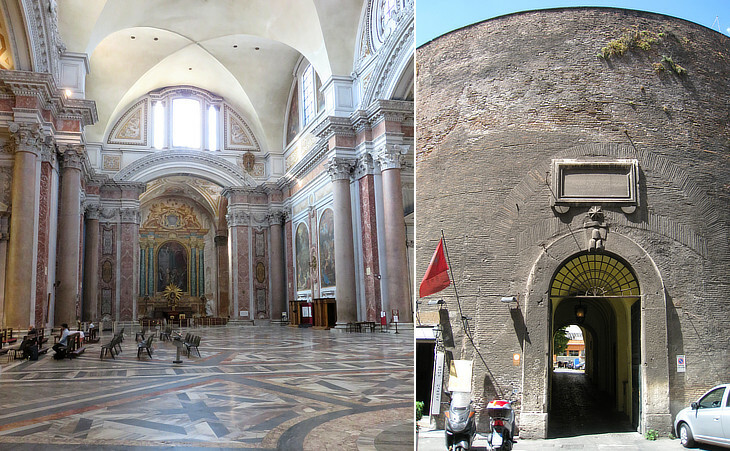 The oldest churches of Rome had the rectangular shape of the Roman basilicas and they were built on the tombs of saints and martyrs, which were located outside the walls: this was the origin of S. Pietro, S. Paolo fuori le Mura, S. Agnese fuori le Mura, S. Lorenzo fuori le Mura and SS. Pietro e Marcellino (which had a circular shape). Owing mainly to the initiatives of Helena, Constantine's mother, who had converted to the Christian faith, other basilicas were built within the walls, although far from the Forum and the Campus Martis: S. Giovanni in Laterano, S. Maria Maggiore and S. Croce in Gerusalemme. With the exception of SS. Pietro e Marcellino, all these early basilicas were replaced by other buildings or were greatly modified in the following centuries. Statue of the Tetrarchs in St. Mark's - Venice. Various paintings portraying Constantine in Sala di Costantino - Vatican Museums. 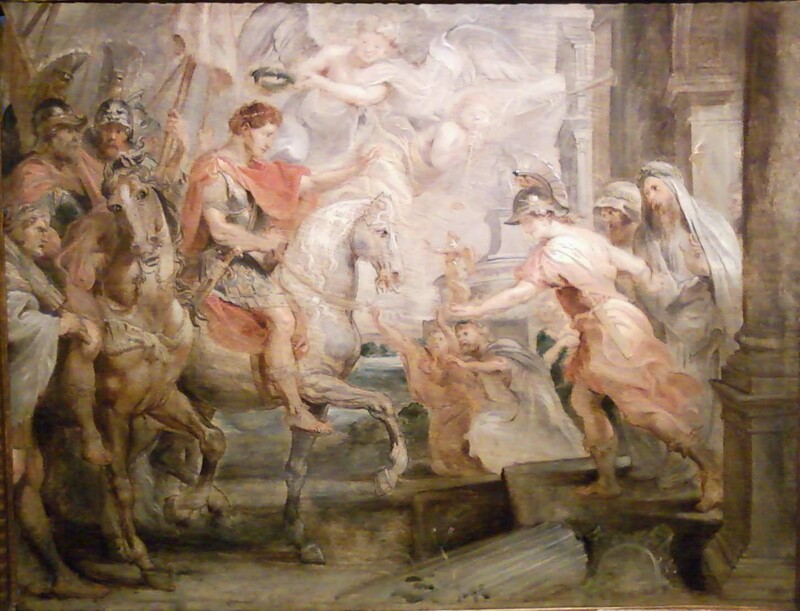 The Entry of Constantine into Rome by Peter Paul Rubens (1622) - it opens in a separate window.